Love Your Library? Be a Friend! 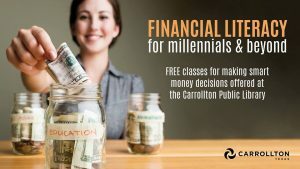 April is Financial Literacy Month, and the Carrollton Public Library, through the support of the Friends, is offering some great sessions to give you a leg up on financial topics like saving, investing, debt management, and more. This series aims to help people in their 20s and 30s better manage their money, eliminate student loan debt, buy that first house, and prepare for the future. Learn about the rule of 72, how interest works, the 3 Ds of investing, and taxes. Why a credit score is important, first time home buying, and managing student loan debt. Do I really need life insurance and a will at 20 years old? And what legal documents are important when planning mine or my parents’ future? If you want to learn more about managing your finances, join one of these sessions this month.